Kenya Finance minister Uhuru Kenyatta has presented the Sh977bn Budget in Parliament that has seen increased funding to projects at the grassroots with the Education, Energy, Agriculture and Roads Ministries the major beneficiaries. Below are excerpts of Mr Kenyatta's Budget speech in Parliament. 16: 45 Speaker Marende adjourns the House to June 15 and invites MPs to a luncheon hosted by Treasury. 16:42 Mr Kenyatta concludes his Budget Speech. 16:40 Amend law to allow pensioners to access their savings within 30 days down from the current 60 days. 16:37 Mr Kenyatta proposes to amend Central Bank Act to disclose information related to surveillance and fraud activities. 16:34 He proposes to amend law to aid Kacc remit funds from seized property to the Consolidated Fund. 16:31 Amnesty on taxation for remittances brought in by Kenyans in the Diaspora. 16:29 Mr Kenyatta proposes to increase excise tax for malt beer. 16:26 Finance minister proposes to amend the law to remove paying advance tax for PSVs drivers and conductors before acquiring licences. 16:17 He proposes exempting import duty on poultry. 16:15 Mr Kenyatta says fiscal framework of 2010/2011 is fully financed. 16:13 Received Sh40.4bn in pledges from external sources, including donors. 16:11 Mr Kenyatta says development expenditure for 2010/2011 is Sh321bn, out of which Sh96bn will be financed by appropriations aid. 16:09 Implementation of last Budget affected by many factors, including prolonged drought and total revenues fell by Sh500m. 16:06 He says the government will adopt leasing and mortgage as a platform to accessing cheap housing. 16:02 Mr Kenyatta says government will take bold steps to but Kenya products to build the country. 15:58 Allocates Sh3.8bn to a revolving fund charged with extending credit facilities to 8.2m Kenyans engaged in the informal sector through SMEs. 15:55 He allocates Sh560m to upgrade all 14 science and technology colleges countrywide. 15:51 Mr Kenyatta allocates Sh1bn to initiate expansion of training institutions towards equipping youth with skills to get employment, grow SMEs. Measures will include reducing days required to start a business, get a business permit, among others. 15:46 Mr Kenyatta says the government has developed strategies to deal with climate change and allocates Sh1.5bn to ensuring conservation efforts are strengthened. 15:43 Sh250m for construction of an additional 10 slaughter houses to boost the beef industry. 15:41 Sh200m to allow construction of watering holes for livestock to benefit pastoral farmers. 15:39 Allocates Sh16bn to financing key projects in the ASAL areas including construction of hospital and low cost schools. 15:37 Communication is restored and Mr Kenyatta says ASAL areas face challenges but there's social economic potential that can be exploited to improve livelihoods. 15:34 A breakdown of communication interrupts the reading of the Budget temporarily. 15:30 Provides for recruitment of six extension officers in every constituency and mobile food driers. 15:29 Mr Kenyatta says government will diversify to other potential areas through irrigation around Tana, Makueni to improve food security. 15: 27 He allocates Sh14.3bn to the CDF to finance development projects at the constituency level and assures MPs of speedy disbursement. 15: 25 He says investment in rural agriculture, including fish farming, is paramount and allocates Sh5.7bn to maintain roads, improve market access, research and other interventions. 15.23 Mr Kenyatta allocates Sh1bn towards recruitment of 15 nurses and 5 technical staff for every constituency to improve health. 15:21 Purchase of 300 computers in each constituency to ensure that they embrace ICT. 15:20 Mr Kenyatta says education is a key pillar to economic development for any country and allocates Sh9.2bn towards Free Primary Education and Sh16bn towards Free Secondary Education. 15:19 Sh1.9bn to upgrade commuter transport in the capital. 15:17 Operational efficiencies have undermined doing business especially at the port of Mombasa says the Finance minister. Government will fast track construction of a standard gauge railway at the coastal town. 15:15 Sh31.5bn to fund expansion in the energy sector, which include 5bn to fund rural electrification. 15:14 On energy, Mr Kenyatta says government will expand resources to acquire cheaper energy. ERC will review electricity tariffs with a view of making cost of power predictable. 15:12 Sh4.2bn to open up Kisumu as one of Kenya's Vision 2030 towns. 15:10 Sh17.86bn allocated to improve Kenya's road network. 15:05 Severe penalties imposed on businesses involved in fraud. 15:04 He says Treasury will push for enactment of various bills, including Partnership Bill, to improve the business climate in the country. 15:03 Mr Kenyatta says Regulatory Bill, if enacted, will check unilateral and arbitrary costs of doing business. 15: 02 Savings form debt refinancing will be used to fund critical development projects. 15:00 Reduce domestic borrowing to a 38pc in 2010/2011. Government has developed a strategy on debt refinancing. 14: 59 He says there's room for improvement of ministries spending within the financial year and urges tem to absorb 80pc of development monies. 14: 57 Directs KRA and Central Bank to carry out audit of forex bureaus and report to him by end of September. VAT refunds within 120 days. 14:55 Mr Kenyatta says tax evasion is an economic crime and government response will be swift and indicts forex bureaus of aiding the vice. 14:54 More needs to be done in tax compliance to ensure government meets its revenue target. 14: 53 Kenya fully committed to implement the EAC framework. 14: 52 Mr Kenyatta says government will prioritise infrastructural projects to drive economic growth. 14: 50 Low inflation at 5pc and expand economic opportunities for Kenyans. 14: 49 Framework will address unemployment among youths by promoting entrepreneurial skills. 14: 47 Kenya must maintain a high growth path and will implement strategic measures including accelerating privatisation, social sectors. 14: 45 Mr Kenyatta says the government will focus on long term efforts as it consolidate economic recovery. 14:40: The Exchange rate has remained stable, but weakened in May as a result of prices in the Euro zone. 14:38 He says that the economy has recovered with a growth of 2.6 pc recorded in 2009 up from 1.6 pc in 2008. 14:32 Speaker Kenneth Marende leads the House with a word of prayer. 14: 25 Finance minister Uhuru Kenyatta poses for a photo opportunity outside Parliament Buildings moments before he reads the 2010/2011 Budget. 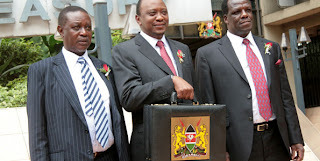 14: 20 Kenya Finance minister will shortly read the Budget in Parliament . Budget estimates for the 2010/2011 financial year released on Wednesday show the government will spend Sh110 billion above last year’s Sh867 billion, representing an increase of 12.5 per cent. This puts pressure to raise more revenues from either borrowing, selling its stakes in businesses and, most probably, increasing taxes. According to the documents, Sh675 billion will go into recurrent expenditure, up Sh68 billion from the previous year, mainly to pay salaries for government workers. At a time when economic recovery has slowed down, growing only 2.6 per cent in 2009 even as the budget kisses the one-trillion-shilling mark, the government will come under critical focus over its spending priorities.